WASHINGTON — President Trump accused Democrats on Thursday morning of “presidential harassment” over congressional investigations into his finances, and he mocked Virginia politicians whose jobs are in peril after revelations they appeared in blackface. The split-screen version of Mr. Trump has become a familiar formula, after two years of slash-and-burn tweets in the morning — and sometimes throughout the day — followed by presidential events meant to convey a somber tone. 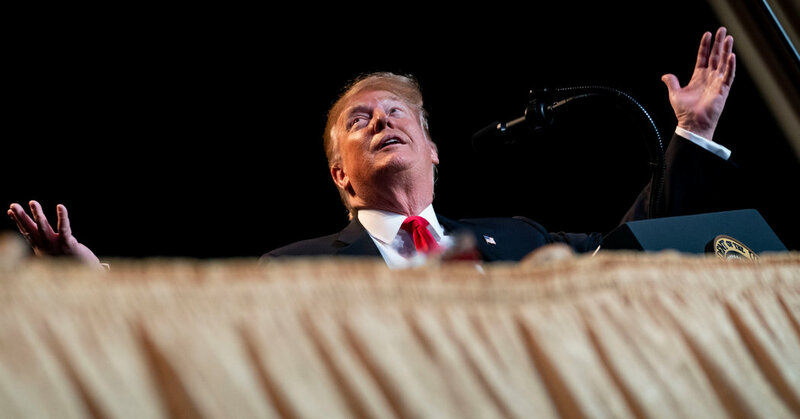 Thursday offered an unusually stark comparison between Mr. Trump’s unvarnished thoughts and his formal schedule, as he seeks to revive his connection to evangelical and conservative voters whose support was crucial to his victory in 2016. “So now Congressman Adam Schiff announces, after having found zero Russian Collusion, that he is going to be looking at every aspect of my life, both financial and personal, even though there is no reason to be doing so. Never happened before! Unlimited Presidential Harassment…” Mr. Trump wrote on Twitter at around 6:15 a.m.
Twenty-five minutes later, Mr. Trump left for the Washington Hilton, where he sat in front of a plate of fruit and bagels, chatting with others, before he was called up to speak at the prayer breakfast. “I will never let you down,” Mr. Trump told the audience, to applause. He boasted that his “administration has taken historic action to protect religious liberty,” and talked about his State of the Union address, in which he proposed new restrictions on late-term abortions. “All children, born and unborn, are made in the holy image of God,” Mr. Trump said. He then discussed Pastor Andrew Brunson, who had been imprisoned in Turkey, and whose case was championed by conservatives. Mr. Brunson was at Mr. Trump’s address on Tuesday. That section brought another, small reminder that Mr. Trump’s teleprompter performances are different than the rawness his Twitter feed or interviews offer.